Brown Quail-Coturnix ypsilophera are a species of birds that we do often encounter around Broome, but rarely get a chance to photograph. Brown Quail sometimes just squat in the grass and you would not even know they are in the area. Our most common encounters of Brown Quail are when we accidentally flush them from long dry grass. 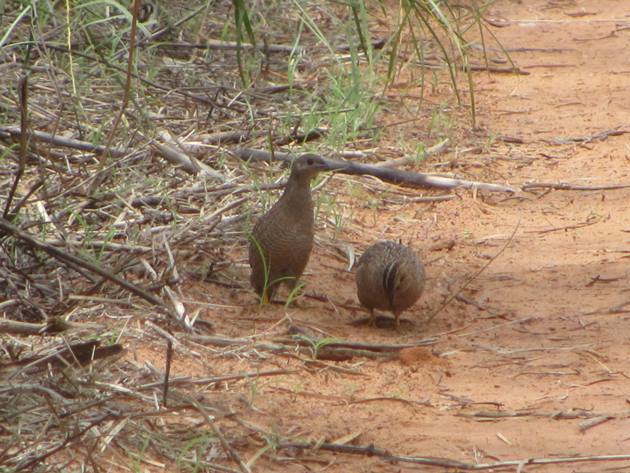 In these situations the Brown Quail shoots off at high speed and then drops. If only one Brown Quail is flushed you expect another to flush shortly after and you are less likely to be alarmed! Brown Quail tend to feed early in the morning, but if the sky is overcast they are sometimes observed feeding later in the day. Last Saturday whilst on a bush-walk we noticed something dark on the edge of the track. It was mid-morning and the sky was overcast and although it was very hot it was quite dull. 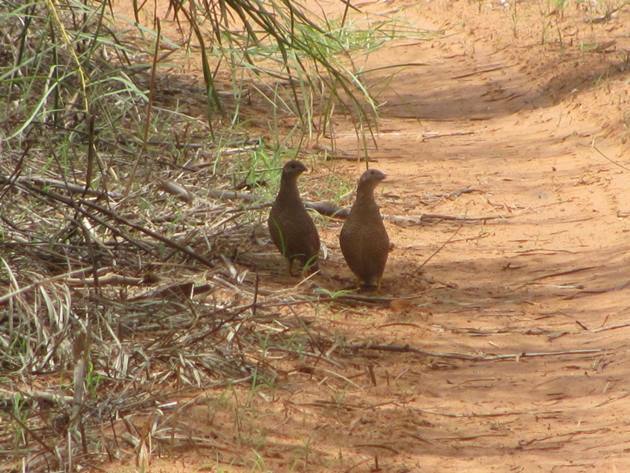 A pair of Brown Quail were beside the track feeding and allowed me to move forward and photograph them. 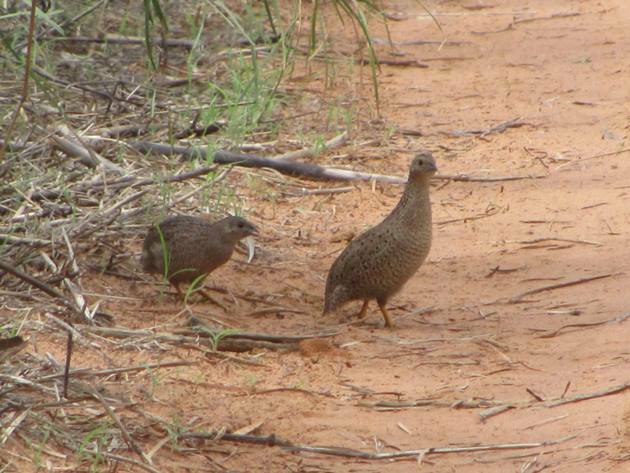 There is a lot of variation in the plumage of Brown Quail throughout Australia, but the female bird is generally paler than the male. 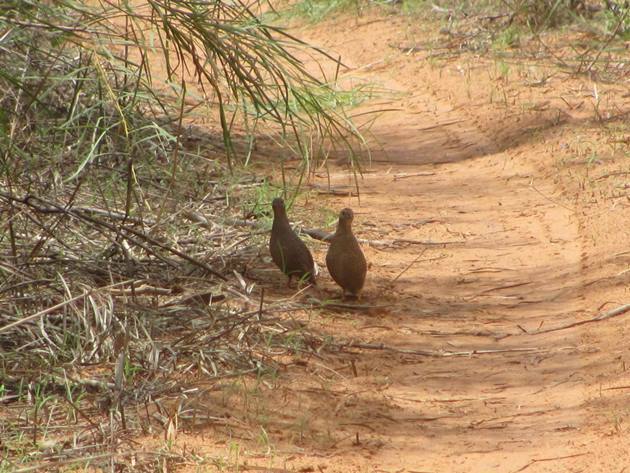 Brown Quail are a very plump bird species and much prefer to run than fly. I moved slowly forward and Grant stayed behind observing the Brown Quail with his binoculars. 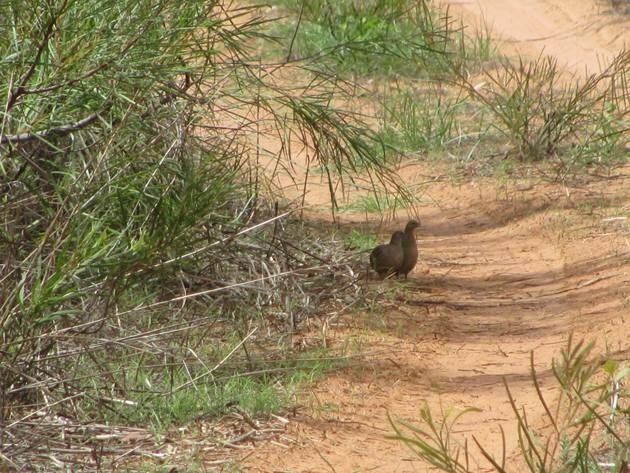 I was delighted to see the Brown Quail continue feeding as I moved forward and they did not appear to be concerned by our presence. 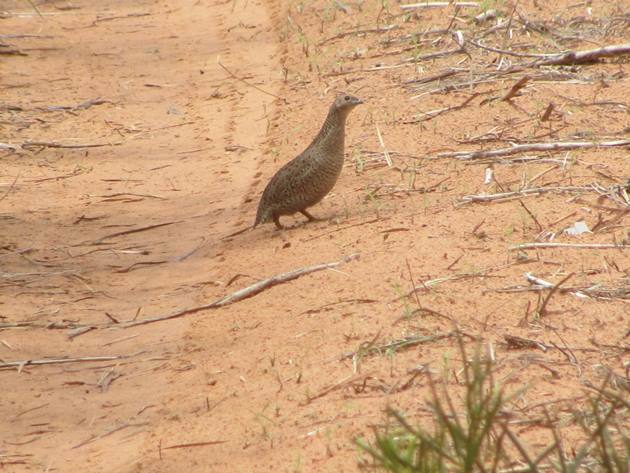 The striped pattern on the Brown Quail’s head was easily visible and after a few moments they decided to cross the track. Brown Quail move fast and I was only able to photograph one right out in the open. The individual had one eye to the sky looking for predators as it crossed the track and they had soon disappeared into the long grass. It was great to not only add Brown Quail to the 2019 Year List in this first week of January, but to also photograph them. There are several bird species that we encounter quite often that I don’t currently have photographs of. Now I will have to see which others I can photograph this year as I add them to the Year List!